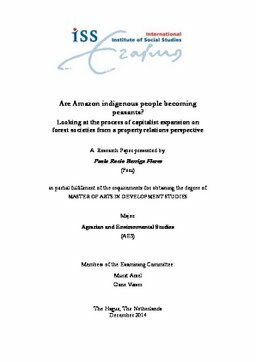 This paper studies how the process of integration of Amazon forest people into State dynamics have also implied an integration to the market economy and capitalist relations. It focus on the case of Awajun population in northern Peruvian Amazon, that in recent years have engage in production for the market, especially with cacao and banana. This research uses a property relations approach as entry point to explore the changes in the area, looking at the changes product of the process of the State and Market expansion; and the changes product of the adaptations of Awajun people as well. It argues that the process of State and Market expansion over the Awajun territory have impacted in the constitution of the general landscape, the organization of people and their increasing dependence of money income. These changes have make people look for new livelihood options as the engagement with market-oriented agriculture. As a result, current property relations are an expression of these process of change and how Awajun people are adapting themselves to these processes.